If you have noticed that your roof is showing signs of typical wear and tear or perhaps has been storm damaged, it is important for you to choose an experienced, professional Murfreesboro roofing contractor to ensure the effective and efficient installation of your new roof. A new roof will surely last for decades, but if installed improperly your new roof can leak, rot, and even have a reduced lifespan. Here at Construct-All USA our highly skilled and professional team of roofers and technicians are committed and dedicated to providing all our valued clients with top of the line services and superior customer satisfaction. When choosing a roofing contractor, you may wonder if your contractor has the appropriate knowledge and expertise to perform your installation. When choosing the team here at Construct-All USA you are engaging a highly reputable team of professionals who have been recognized time and time again for our superior products, services, friendly and professional team and our affordable prices. No matter the size or the complexity of your roofing project, rest assured we are the team for you. Roof Inspections – though you may not see any visible signs of wear or tear or damage to your home’s roof, our professional team will perform a roof inspection to ensure the overall safety and security of your home and family. We will identify any problems, uncover any leaks that are present as well as various other types of damage that may not be easily visible with the naked eye. Roof Replacements – A roof replacement is quite a costly investment. However, our friendly and professional roofing experts will use the highest quality products to ensure the aesthetic appeal and overall functionality of your roof for decades to come. New Roofs – If you are in need of a new roof for your garage, your shed or any other addition to your home or living space, our consultants and roofers will take every step to ensure that the new roofing materials used match with the existing décor of your home’s roof. We take tremendous pride in our ability to satisfy the needs of all our clients and are happy to assist with all your decision-making. There are many ‘wanna be’ roofing contractors out there, many of whom make their presence known primarily in the fall and spring months. It is important to ensure that your Murfreesboro roofing contractor has all the training, experience, expertise and know-how needed as well as industry recognitions and credentials. That is where our professionals come in. All our roofers and technicians are licensed and certified and are equipped with the most innovative tools, software packages and techniques needed to perform our roof repairs and installations at the top of the charts. If you choose to work with our successful, highly reputable team of roofers you can be sure that we use only the highest quality materials to perform all our roofing jobs. In addition, we have a wide range of styles as well as colors to choose from, and our materials are tested to withstand winds of up to nearly 120 miles per hour. Further, we offer algae and impact resistant materials with energy efficient features and take pride in our eco-friendly practices and our product warranties as well. 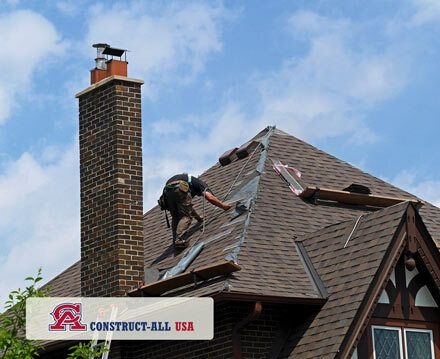 For the most experienced, friendly and highly reputable Murfreesboro roofing specialists, you can always count on the team here at Construct-All USA. Simply give a call out to our team to schedule your free consultation and estimate and let us take care of all your roofing needs. We look forward to serving you and to providing you with the best all round roofing products, materials and services this side of Tennessee! !